At TWD Inc, we think used clothing donation bins are beautiful, because we know exactly what they are providing for local communities. Lately there has been some media around the aesthetics of the bins when they appear in a general area. When we see an area with several bins, we see a sustainable community. It is common knowledge that our landfills will be at capacity in 20 years. We know it is possible to divert and recycle all sorts of waste, because there are countries like Sweden that have actually run out of garbage, and now import it from Norway. Waste processing has now become a major industry in Sweden. Products are recycled into new things or used to generate energy. Why not in Canada, or Ontario? Used clothing collection falls under the realm of residential recycling for the most part, and a 39% waste diversion rate in that area is a decent start. Textiles only represent about 5% of landfill volume in Canada and so has been the least of our green-tech priorities. The European Union believes the opposite, and has supported green-tech advancements in textile recycling that has allowed them to ban textiles from landfills by 2015. 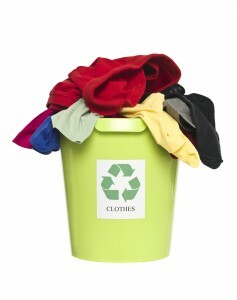 It’s totally unnecessary to put textile waste in landfills, because 98% of it is completely recyclable. It’s an easy 5% to get rid of. Unlike Canada that has no market for unsalvageable textile waste, Europe finds exciting uses for it and have created a whole other market, helping to energize the economy and make the landfill ban ‘worth it’ for the private sector. Textiles in landfills aren’t a lot of the volume, but because even natural fibres can take a century to decompose, their volume increases over time cumulatively. Textiles in landfills are highly toxic polluting the air and groundwater. Some are also prone to mould in landfills that is highly flammable and self igniting. It takes way less energy and fewer chemicals to recycle a piece of fabric into new fabric than it does to make fabric from scratch. This also reduces the need for natural fibre producing farms, making room for farms to produce food in a time of global food insecurity, much of it due to loss of farms due to urban sprawl. Waste diversion industries employ 7 direct full time and 15 indirect jobs per 1000 tonnes collected. Here at TWD Inc., we are projecting to divert 30 million pounds of textiles and 2 million pounds of other recyclables from landfills in 2013 alone! While other companies are laying off, our family is growing! When you see a cluster of new bins in your area, visualize the processing facility that just got rented locally, the fuel purchased, the vehicle bought and continually maintained locally, the bins made, signs printed, insurance bought, licences paid. All that creates LOCAL jobs. When you see those bins pop up visualize the shrinking landfills and the money municipalities are saving by having this waste diverted by the private sector. The unique thing about textile recycling as that many recyclers partner up with great charities turning an environmental service into a community driven social enterprise. There are some communities that really fight the influx of used clothing donation bins. We believe that if the general public knew exactly the benefits of the textile recycling industry, everyone would be begging for a bin. With so many great charities using textile recycling as a stable form of fundraising, property managers have a wide variety of great causes to support. By permitting a bin on your property, you are supporting your local community, as well as the charity that benefits.